Chicken Keto Pad Thai — You Wont Miss the Noodles! Keto Pad Thai is a delicious departure from the mundane, ordinary low carb recipes that can totally flood our meal plans. 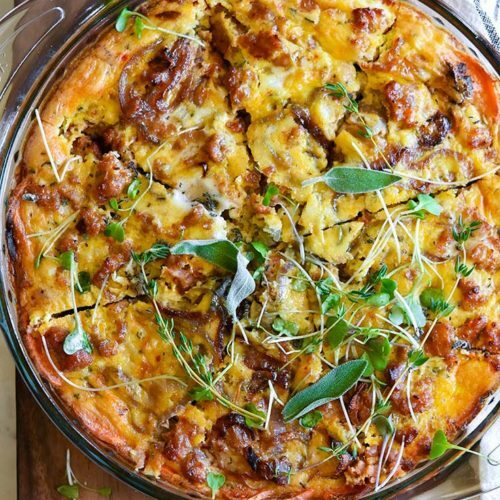 I have an addictive low carb dinner that I’m thrilled to share with you. Keto Pad Thai is everything you want it to be: tangy, stir-fried satisfaction—cilantro, scrambled egg, and all. 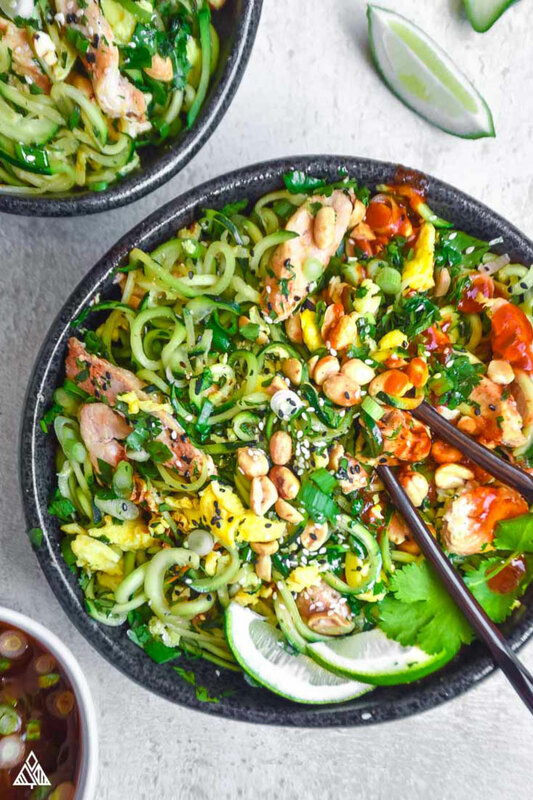 My recipe starts with a base of low carb pad thai zucchini noodles, and adds layer after layer of scrumptious Thai flavors: fish sauce, aminos, chicken, peanuts—need I go on? If you go with a traditional recipe, you’ll find there are a lot of carbs in pad thai—100 grams, or an average bowl, has around 360 calories and 80.4 grams of carbs. Sounds daunting, but don’t fret! 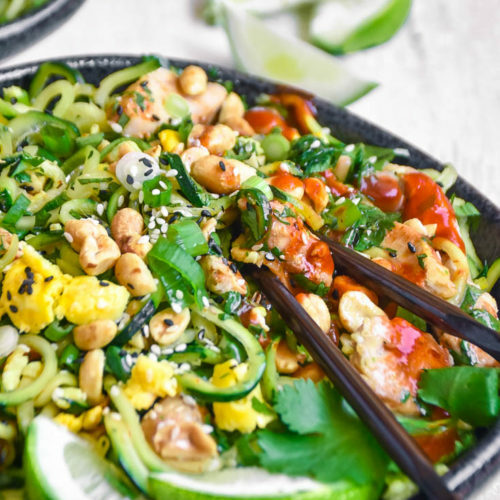 In this delicious low carb Pad Thai recipe we’ll lose the carb content and keep the Thai deliciousness: with just a little savvy, my trusty guidance, and a good vegetable spiralizer doesn’t hurt either. The main troublemaking ingredient in pad thai are those darn rice noodles, which pack a huge, worthless, carb-laden punch to your healthy low carb food list. 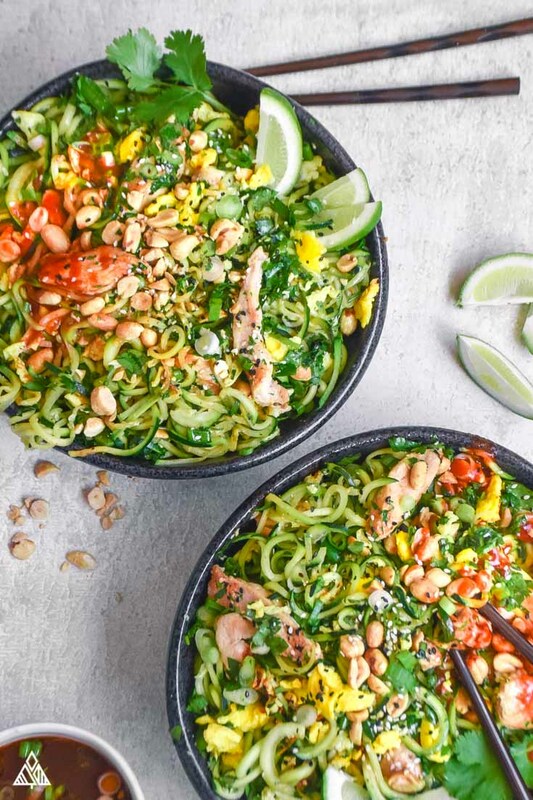 Enter low carb noodles—or more specific to this recipe, fibrous and nutrient-rich keto pad thai zucchini noodles. Problem solved while retaining everything you already love about pad thai. 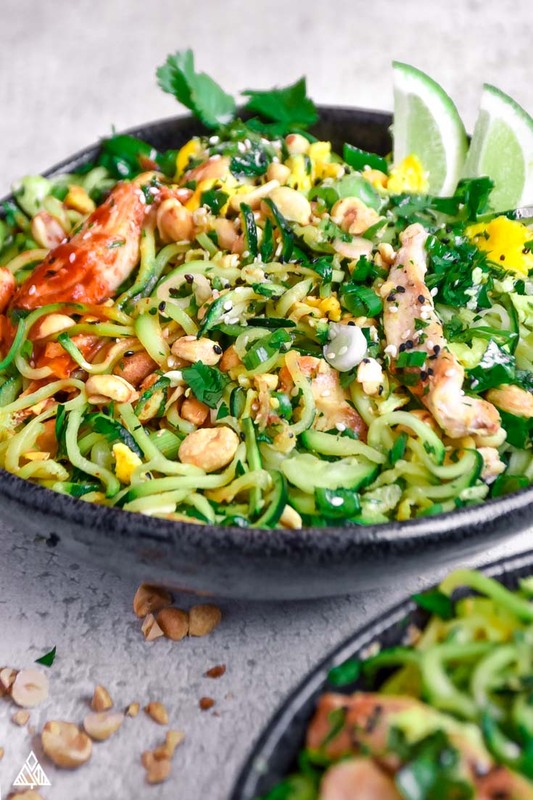 I personally go for spiralized zucchini recipes, which we in the low carb community have lovingly dubbed “zoodles.” Keto pad thai zoodles are my favorite because zucchini perfectly complements this low carb pad thai sauce. 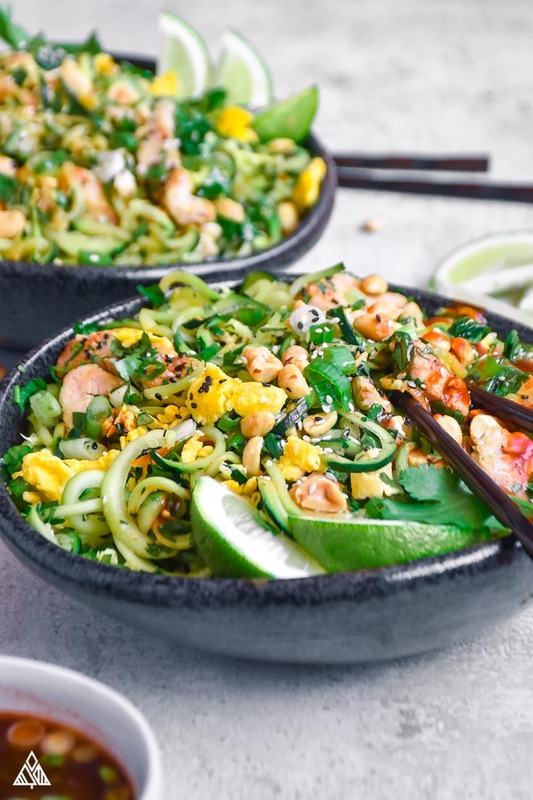 You can use any kind of low carb vegetables you like to make vegetable noodles—cucumbers would be delicious in this recipe, as well as summer squash. Check out this super quick how-to from the master of spiralizing to see just how easy spiralizing really is! If you don’t have a spiralizer, use a cheese grater to get that veggie noodle shape. 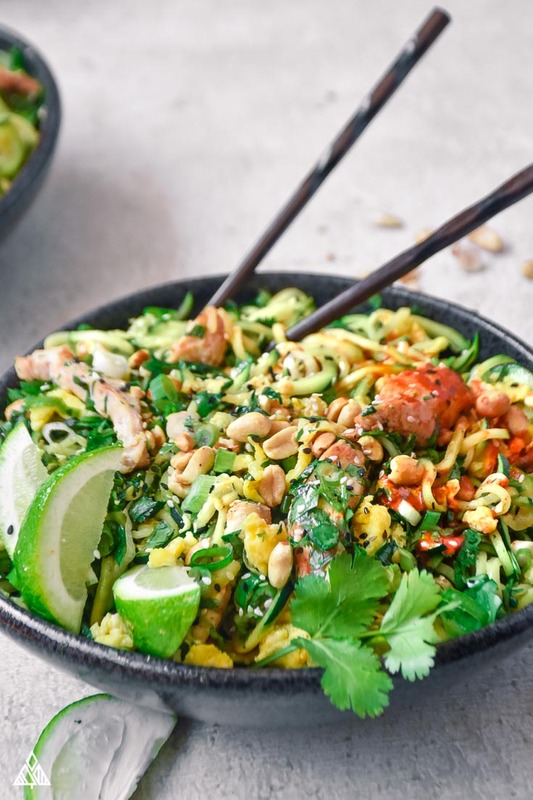 You can also try out keto pad thai spaghetti squash—that large, yellow, buttery squash that naturally separates into noodles after it’s baked, and it’s dee-licious. 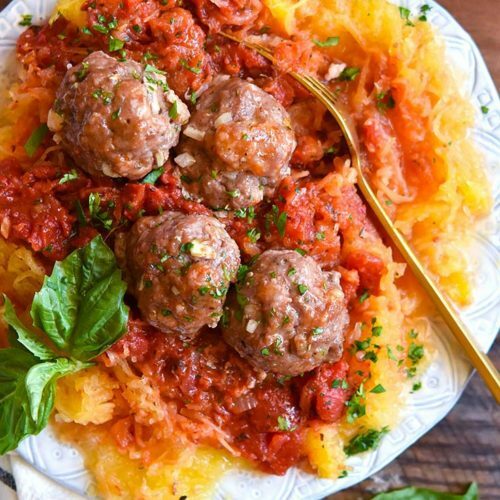 The only consideration with spaghetti squash is a little extra oven-time. Keto pad thai and keto pad see ew are just a couple of the recipes you can base off of a good piece of spaghetti squash! Shirataki Noodles are thin, translucent, gelatinous traditional Japanese noodles made from the konjac yam (devil’s tongue yam or elephant yam). Largely composed of water and glucomannan, a water-soluble dietary fiber, they’re very low in digestible carbohydrates and calories, and have little flavor of their own. Low carb pad thai shirataki noodles work well at absorbing flavor and lending slurp-factor. They’re easy to find at your local Asian market or health food store (I find mine at Whole Foods)—definitely a unique ingredient that’s worth trying! You’ll find a whole lot of shirataki noodles out there, I’ve only taste tested miracle noodles and they have my serious stamp of approval! 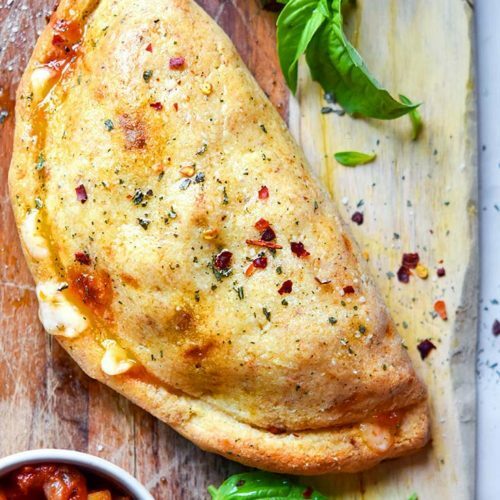 They come in all sorts of fun shapes and sizes to accommodate whatever you’re craving. Fair warning: not everyone loves the taste of these shirataki noodles. If you plan to try them out, report back and let me know what you think! Coconut Flour is used in this recipe to help thicken the sauce. Although low carb flours don’t have the same effects as cornstarch or flour, it does help to absorb some of the liquid, and disperse the Pad Thai sauce flavors equally. Coconut flour also adds a touch of nutty luxury to an already delectable sauce. Brown sugar is common in pad thai recipes, however I used granulated erythritol instead, which has no net carbs (but does have the mild sweet taste and tingly mouthfeel of fructose sugar.) Erythritol is bar-none my favorite substitute for brown sugar, but a few drops of liquid stevia can do the trick as well. One cup of sliced zucchini will supply 3.5 grams of carbs. Cilantro is nearly carb-free with less than a gram per cup (and if you can eat a full cup of cilantro, that’s seriously impressive.) Scallions are a fantastic source of flavor without contributing much carb content at all. Shitake mushrooms, spaghetti squash, and cucumbers are also all low carb veggies with a ton of different vitamins, minerals, and beneficial fibers. 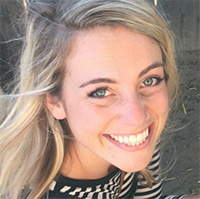 When you ditch simple carbohydrate noodles made from rice or wheat, you don’t just lose the useless, bloaty carb content—you gain the health effects of increasing your vegetable intake, which has powerful benefits to your health, cognition, and well-being. Go greens! 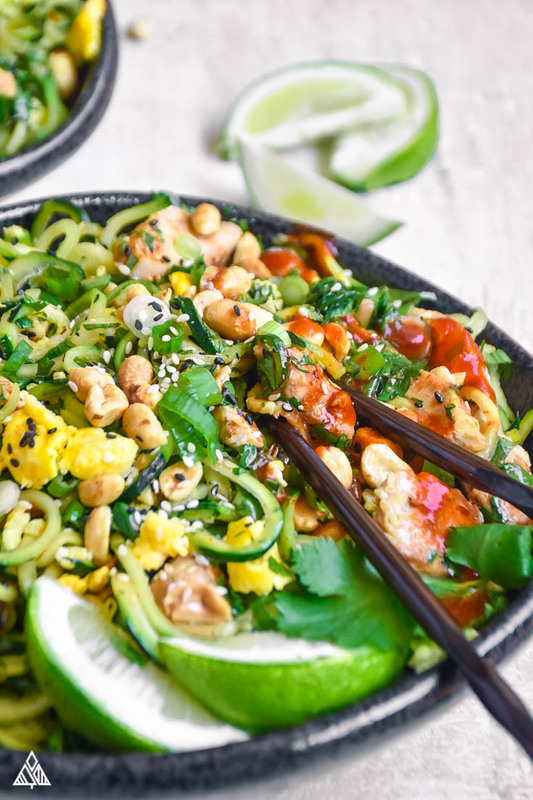 Low carb, but absolutely not low flavor—this keto pad thai is the addictive zoodle recipe you've been looking for! Scramble and cook the eggs. Set aside. Chop the peanuts. (I like the peanuts slightly chunky so I roughly chop them) Set the chopped peanuts aside. Mix the ingredients for the sauce in a medium sized bowl. Set the sauce aside. Heat half the oil in a large skillet at medium heat and add the chicken. Season with salt and pepper. Once the chicken is cooked thoroughly (no longer pink), pull chicken out of the skillet and place on a plate. Turn the heat on the skillet to low and add the zucchini noodles. Let the juice from the chicken coat the noodles then add salt and pepper to taste. Cook until the zucchini has lightly softened (about 3-5 minutes). Pull the noodles out of the skillet and into a large bowl. On low heat, add 1/2 tablespoon of oil to the skillet, then add the garlic and scallions - stir constantly so they do not burn, cook until the scallions begin to soften (about 1 minute). Add the sauce to the skillet. Add the coconut flour, turn the heat to medium and whisk the flour until it dissolves and thickens the sauce. After the sauce has thickened, add the noodles, chicken, eggs and roughly chopped peanuts to the sauce. Toss all the ingredients in the skillet to combine completely. Garnish the dishes with cilantro, scallions and peanuts. Enjoy! You can use whatever veggies you’d like for the noodles. I used zucchini because they’re low carb and easy to spiralize – carrots and summer squash would work well too. Or try a combo. 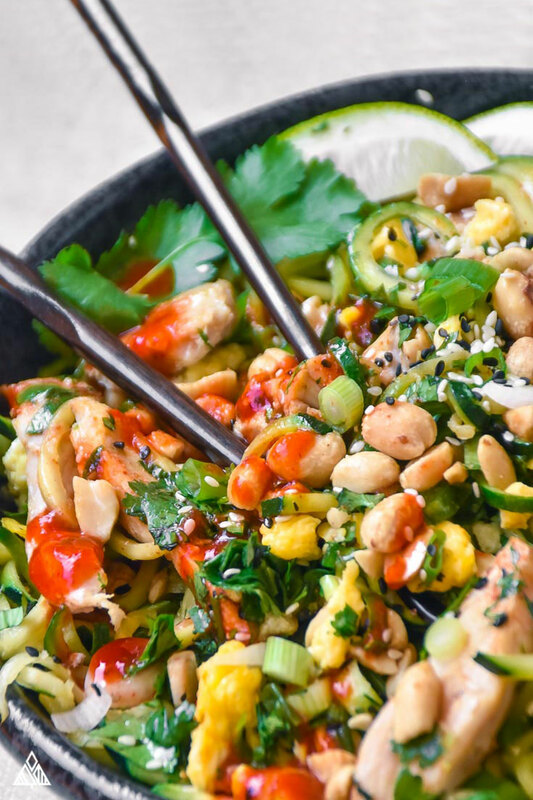 Chicken pad thai shirataki noodles are seriously satisfying, and make a fun addition to your low carb chicken recipes book. Baked chicken will always be there for you, but it’s so rewarding to think outside the box and take dinner inspiration from a culture with a penchant for amazing flavor.